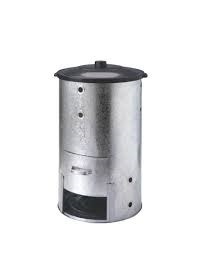 A small (base diameter 52cm, height 54cm) 40 litre capacity cone shaped decorative composter in bright galvanised metal. Fitted with an easy-access sliding hatch. Both hatch and lid have a handle for ease of use. Made in the UK. 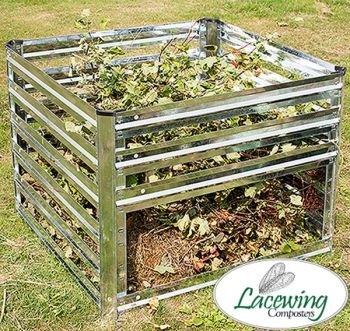 A round galvanised composter is said to provide an environmentally friendly means of composting for those wjho wish to avoid plastic and do not want a wooden bin.This model manufactured from 22 gauge galvanised steel, has a a rubber lid, and a large hatch at its base.